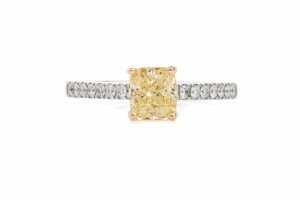 I have recently come across an interesting article from GIA on Yellow Diamonds. After talking about yellow diamonds with clients on a regular basis it was really refreshing to read an article that backed up a lot of the information we have known and tried to spread for many years. The first thing that is really important to note is these are not white diamonds. So if you know a lot or even a little about white diamonds, try to set that aside and be open minded about yellow diamonds as different factors are important.